Background: Ancient Ayurveda seers presented the knowledge in coded language, in the form of Sutras (verses). These verses are characterized by Padairalpam, Matimbuddhwa, i.e. having few words with concealed meaning with larger applications which can be explored with the help of Sanskrit grammar. Sometimes, just translation of the original verses might not convey the authentic and primary aim of the author as it depends on various factors such as the context, time and place. For this purpose, various commentators have adopted the methodology of integrating Nyayas (maxims) in their respective commentaries. Shringagrahika Nyaya (SGN) also belongs to the same category as it has been mentioned in several contexts in Chakrapani's Ayurveda Dipika (AD) commentary on Charaka Samhita. It is the maxim of seizing the ox by its horns. The present work is an attempt to explore the different contexts of SGN in AD commentary. Aim and Objective: To explore the significance of SGN in understanding Charaka Samhita in context to AD commentary of Chakrapani. 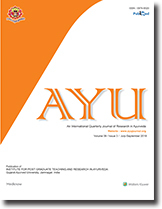 Materials and Methods: Original text of Charaka Samhita along with Chakrapani's commentary, other available translations and published articles in peer-reviewed journals, published books and subject-related material available online have been thoroughly screened, compiled, organized and described in a systematic manner. Observations: Thorough screening of AD commentary of Charaka Samhita revealed that SGN has been mentioned in 12 different contexts out of which some are in positive and some are in negative sense. In a group of similar objects to indicate a particular one, this maxim has been used. Conclusion: To get authentic apprehension of Ayurvedic treatises, the knowledge of SGN is essential for the physicians, especially for better understanding of Charaka Samhita as well as successful implementation of fundamental concepts for the management of various disease conditions. Background: Prakriti (body constitution) is an important concept of Ayurveda which is decided at the time of birth. It shows differences in physical, physiological and psychological characteristics of an individual. Variation in skin characteristics is found as per Prakriti. Aim: The aim of the present work was to study hydration of skin over volar forearm in people with different Prakriti with the help of skin diagnostic SD 27 instrument. Subjects and Methods: This was a cross-sectional study conducted at Cosmetic Technology Department in unmarried healthy female students of (18–30 years). A total of 904 volunteers were screened, of which 621 volunteers were further examined for Deha Prakriti for screening of single Dosha dominant Prakriti. 58 Vata, 70 Pitta and 61 Kapha dominant Prakriti were eligible for further study, but on actual day of skin examination, 50 volunteers in each group completed the study. Skin hydration was measured by skin diagnostic SD 27 instrument. 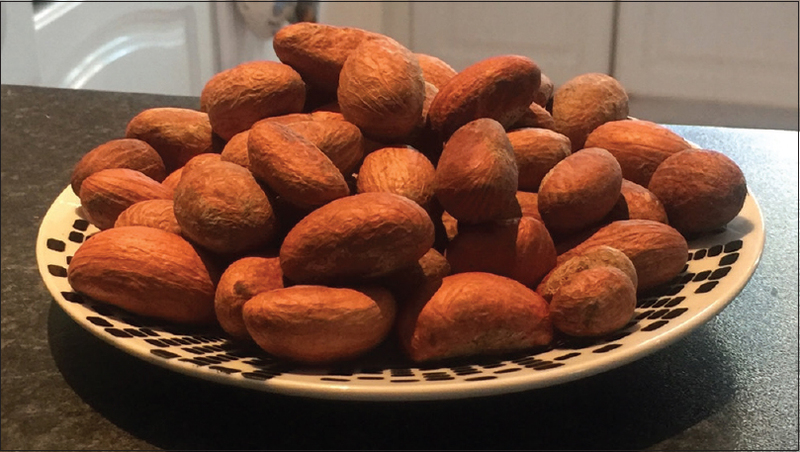 Results: It was found that maximum people with Vata (92%) and Pitta dominantPrakriti (70%) had less hydration while (48%) Kapha dominant Prakriti volunteers had normal to dehydrated skin. Chi-square test was used for analysis. The Chi-square value is 45.9 and P= 0.0001, which is highly significant. Conclusion: The skin of Vata and Pitta dominant Prakriti had less hydration while hydration was well maintained in Kapha dominant Prakriti than that of Vata and Pitta Prakriti people. Background and Objectives: Type 2 diabetes is a multifactorial disorder that results from the interaction between genetic predisposition and environmental factors. Different Prakriti (body constitution) individuals have different susceptibility for the diseases, and this Prakriti is determined by both genetic and environmental factor. This study was undertaken to determine the association status of Methylenetetrahydrofolate reductase (MTHFR) C677T and A1298C with type 2 diabetes and Prakriti. 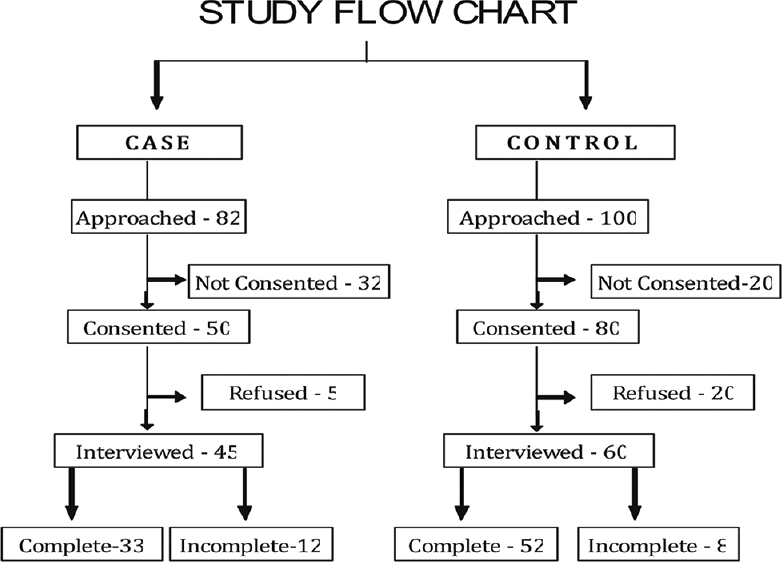 Materials and Methods: After informed consent, 54 patients with type 2 diabetes and 56 individuals as normal controls were analyzed. Their constitution and pathological data were collected and MTHFR C677T and A1298C genotypes were determined. Results: Kapha/Kapha-Pittaja Prakriti were associated and found to be strong risk factors (Chi-square test = 39.67, P < 0.00001, odds ratio [OR] = 16.133, 95% confidence interval [CI] = 6.32–41.20) for type 2 diabetes. MTHFR C677T was associated (Chi-square test = 7.743, P= 0.02) with type 2 diabetes where the major CC genotype was found to be a risk for type 2 diabetes (OR = 3.78, 95% CI = 1.14–12.45). A1298C was not associated with type 2 diabetes (Chi-square test = 2.264,P= 0.322). None of the Prakriti was associated with C677T and A1298C variants. Interpretation and Conclusion: In the present study, an extremely strong association between Prakriti (Kaphaja/Kapha-Pittaja) and type 2 diabetes (P < 0.00001) was detected. The present study gives a strong clue for the association of Prakriti (body constitutional) and clinical phenotype. Introduction: The roots and stem of Dalbergia volubilis Roxb. are used by tribals for management of various ailments. Aims: The aim was to study the macro- and microscopic characters, physiochemical and preliminary phytochemical parameters including high-performance thin-layer chromatography (HPTLC) of D. volubilis root and stem. Materials and Methods: Experiments were performed on authenticated plant materials, following standard procedures and standard deviation was calculated using Microsoft Excel. Results: Externally, the root is creamish to dark brown in color and internally creamish, and its transverse section reveals general anatomy of dicot root. Young greenish stem, on drying, turns maroon or dark brown in color and microscopy shows dicot stem anatomy with secondary growth. Powder microscopy of root and stem reveals the presence of starch grains and rhomboidal crystals. Physicochemical parameters reveal that loss on drying of root is 10.02% w/w and stem is 7.51% w/w. Spectral comparison of similar Rfis 0.95, 0.82, 0.94 and 0.95 at short and long ultraviolet, respectively. Conclusion: D. volubilis root can be identified by the presence of abundance of starch grain, brown content and intraxylary pitting. Presence of hooks, interxylary phloem and crystal fiber are one of the rare anomalous growth patterns in stem. Results of preliminary phytochemical analysis including HPTLC on root and stem will help in further standardization. Introduction: Kshara is derived from the word “Ksharana” that means as something that mobilizes and removes the deformed flesh, skin, tissue, etc., due to its corrosive nature (Ksharanata). Pratisarniya Kshara has been further classified into three types on the basis of its potency – Mridu (mild), Madhyama (moderate) and Tikshna (strong). This study aims at comparison between (Mridu and Tikshna) Apamarga Kshara on the basis of pharmacognostical and pharmaceutical evaluation. 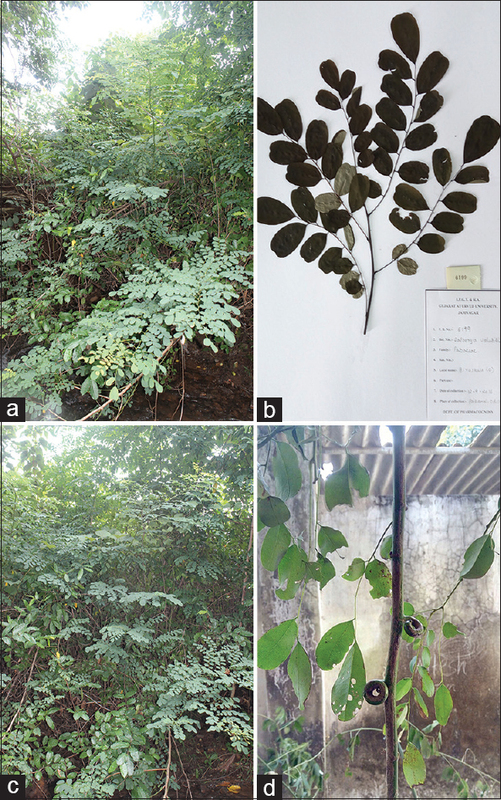 Materials and Methods: Apamarga Panchanga (whole plant of Achyranthes aspera Linn.) was collected, and authentication was done by the expert. Mridu Apamarga Kshara (MAK) andTikshna Apamarga Kshara (TAK) were prepared as proposed by Sushruta Samhita. Pharmacognostical and pharmaceutical analyses were carried out according to standard protocol. 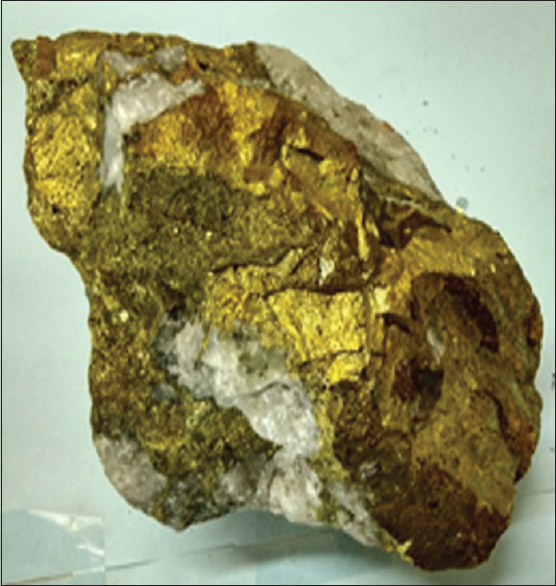 Observation and Results: Both the Kshara showed their own peculiar crystal system and analytical findings showed higher pH value (10.65) and calcium content (6.1%) in TAK as compared to MAK. 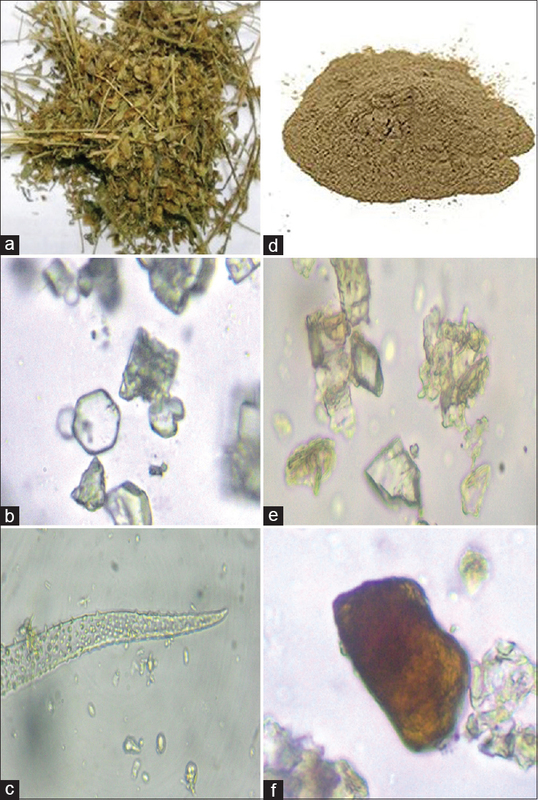 Discussion: Quantitative micrometric microscopy showed more amount of crystals in TAK (13/mm2) than MAK (6/mm2), which may be due to Kapardika and Chitrakamoola (roots of Plumbago zeylenica Linn.). pH of MAK and TAK was 10.2 and 10.65, respectively. This result showed that TAK is more alkaline, which may be also due to Kapardika and Chitrakamoola. Conclusion: Sodium and potassium ion concentration was higher in MAK (Na+ = 26%, K+ = 45%) as compared to TAK (Na+ = 12.6%, K+ = 32.5%). Calcium ion estimation was lower (2.31%) in MAK and higher (6.1%) in TAK. These findings can be further used for the standardization purpose of Tikshna Kshara which may enrich the Ayurvedic Pharmacopoeia of India. Background: Garlic (Allium Sativum) is ubiquitous, small and commonly used spice for processing food. There are many types of garlic and differ in shape, size, color, taste, number of cloves per bulb and storability. Objectives: To determine and compare the antibacterial activity of soft neck and hard neck species of garlic against cariogenic bacteria (Streptococcus mutans and Lactobacillus acidophilus). Materials and Methods: The well diffusion method was used to evaluate the antibacterial activity of garlic against Streptococcus mutans and Lactobacillus acidophilus. 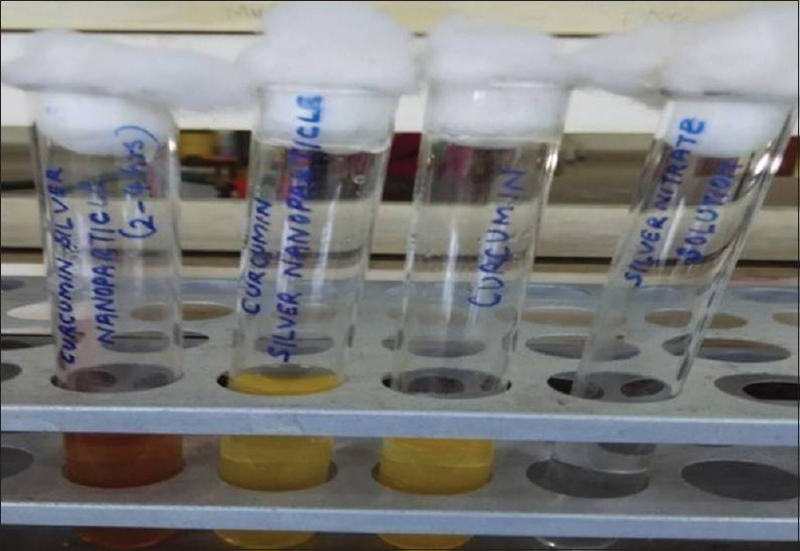 After incubation in an appropriate culture medium, diameter of zone of inhibition was measured to assess the antibacterial efficacy of garlic extract. Chlorhexidine mouthwash (ICPA HEALTH PRODUCTS LTD.) was kept as control group. Results were statistically analyzed using Kruskal Wallis test and independent 't' test. Thus, zone of inhibition (in mm) was analyzed using mean of all the readings obtained and the level of significance at <0.05 was considered statistically significant at 5% of level of significance. Results: Maximum zone of inhibition was found with hard neck garlic extract (24mm) followed by soft neck garlic extract (18mm) and Chlorhexidine (17mm) against Streptococcus mutans and Lactobacillus acidophilus. 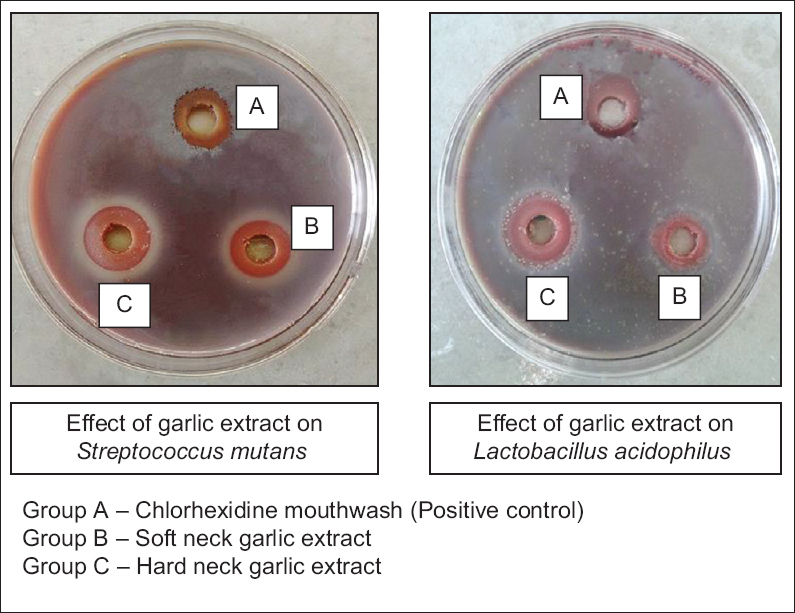 Conclusion: Action of garlic against Streptococcus mutans and Lactobacillus acidophilus raises the possibility that it can be used for dental caries and other oral infections possibly.